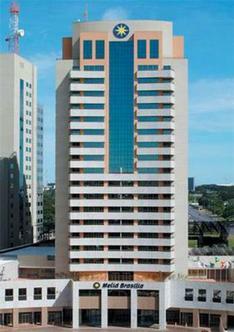 In March 2003, the Melia Brasilia opened its doors. It is the first 5* hotel in the Brasil XXI complex, strategically placed in the Monumental Axis, between the Television Tower and 50 meters from the City Park. It is also within easy reach from the commercial and financial districts, the Esplanade of Ministries and the Juscelino Kubitschek International Airport (13 km). The hotel is close to a number of leisure and entertainment venues, such as bars, restaurants and only 50 m distance from a shopping mall. The Melia Brasilia hotel boasts 270 comfortable rooms equipped with Air-conditioning, Cable/Satellite TV, hair-dryer, Electronic safe deposit box, Workstation, Mini-bar and Internet Access. 24-Hours Room Service. There are a limited number of non smoking rooms and rooms for the disabled. The hotel's gastronomic offer includes the "Norton" Grill with International Cuisine, the best grill available in the city and the "Churchill" Lounge Bar which offers fine wines and cigars in the lobby. For those moments of leisure the hotel has at your disposal Health Club, sauna and swimming pool.